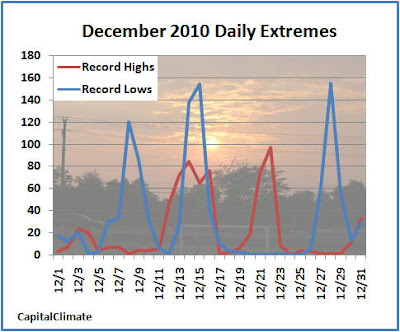 For the first time in 2010 since February, the December number of daily record low temperatures in the U.S. exceeded the number of record highs. 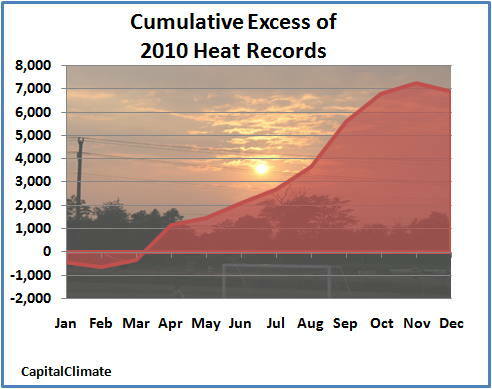 The excess of cold records, however, barely made a dent in the cumulative excess of heat records which had built up to more than 7200 over the spring, summer, and fall. The cumulative excess finished the year 2010 at a little under 7000. The monthly total of 1052 daily record low minimums also barely exceeded the 903 record high minimums. Both cold and heat records were far exceeded by the over 2500 daily precipitation records. After reaching a level of over 4:1 in each of April, June, September, and October, the ratio of heat records to cold records was 2.28:1 for the year 2010 overall. The daily record count shows that the cold extremes were not consistent through the month. They were centered around 3 sharp Arctic outbreaks peaking on the 8th (120 records), 15th (154 records), and 28th (155 records). 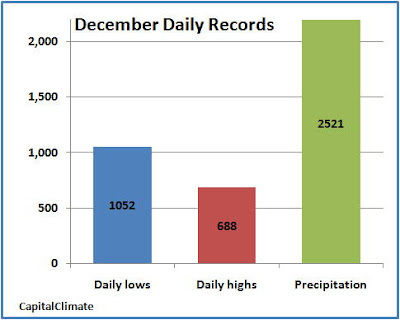 Heat records dominated strongly during the week ending on Christmas, when a total of only 3 cold records were reported, vs. 207 heat records. 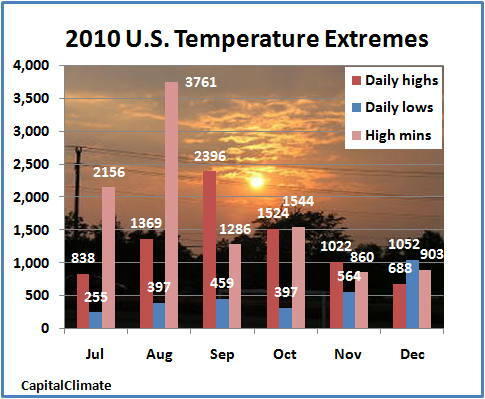 For the entire year 2010, preliminary surface temperature data from NCEP/NOAA show that most of the U.S. averaged near or above the climatological mean, except for the southeast coast and Florida. - Monthly total number of daily high temperature, low temperature, and high minimum temperature records set in the U.S. for July through December 2010, data from NOAA National Climatic Data Center, background image © Kevin Ambrose (www.weatherbook.com). Includes historical daily observations archived in NCDC's Cooperative Summary of the Day data set and preliminary reports from Cooperative Observers and First Order National Weather Service stations. All stations have a Period of Record of at least 30 years. 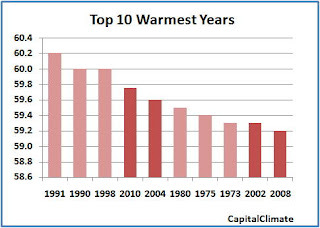 CapitalClimate's analysis of preliminary National Weather Service (NWS) data shows that 2010 was the 4th warmest year on record in Washington, DC. 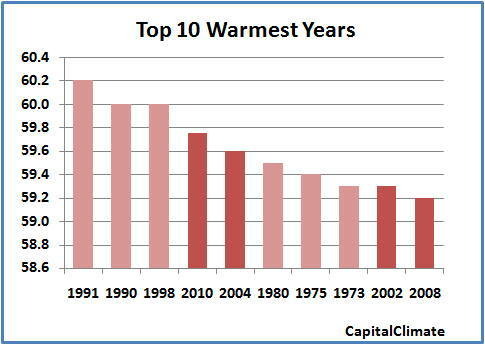 The annual average temperature of 59.8° exceeded the 1971-2000 climatological baseline by 2.3° and was only 0.4° below the record high of 60.2° in 1991. 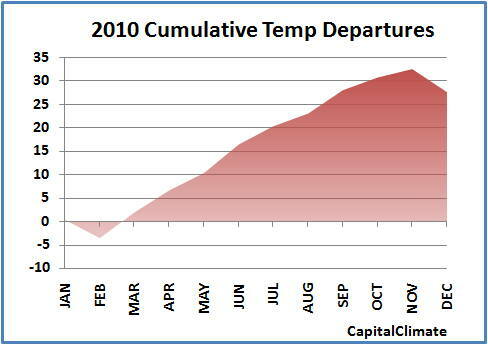 Of the top 10 warmest years in Washington, 4 have occurred in the past decade (darker red shading in the chart). The year 2006 is now in 11th place, so all 5 of the most recent even-numbered years are in the top 11. 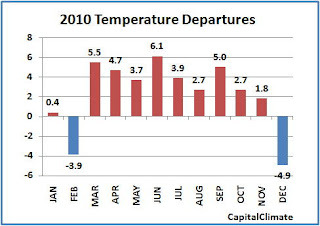 December 2010 was the coldest month of the year relative to average. December's departure of -4.9° from the climatological average of 39.5° exceeded February's -3.9°, but those 2 were the only below-average months in 2010. 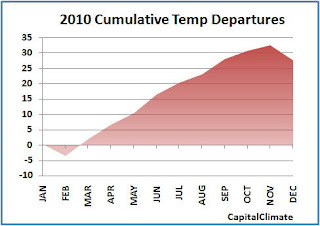 After dipping below average in February, the cumulative temperature departure for the year climbed steadily through the spring, summer, and fall, reaching a peak of 32.6° in November. The Washington December average temperature of 34.6° was the second consecutive below normal December reading and the coolest since 2000, when the average was nearly 3° lower at 31.8°. There have been 4 other Decembers in the past decade with below-average temperatures: 2002, 2003, 2005, and 2009. 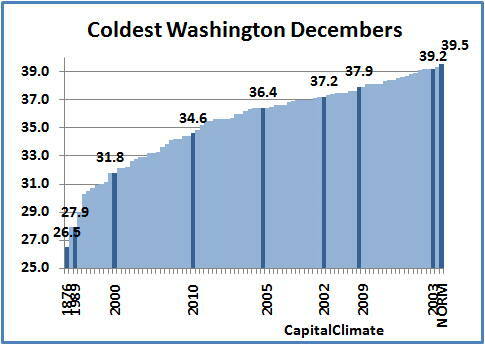 The coldest December on record in Washington was 1876, with an average of 26.5°, over 8° colder than in 2010. The most recent December in the top 10 coldest was 1989 (27.9°), and there has been only 1 other top-10 December in the last 50 years, 1963. Overall, December 2010 was the 30th coldest since official Washington records began in 1871. Regionally, the Mid Atlantic states were on the northern edge of a cold area relative to average which extended from the Ohio Valley southeastward through the Carolinas, Georgia, and Florida. Northern New England was near to much above average, and the entire area from Texas northwestward through the western Plains, Rockies, and westward to the Pacific coast was warmer than average. Most of Colorado, Utah, Nevada, Arizona, and New Mexico were much warmer than average. For the Northern Hemisphere as a whole, there were few other areas of significantly cold temperatures. The most notable region from a news standpoint was the one which extended from the UK eastward across northern Europe and into parts of Siberia. Far northwestern Canada and parts of Alaska were also colder than average. In the Southern Hemisphere, cold temperatures relative to average were found in western Antarctica, the Pacific coast of South America, and eastern and northern Australia.